For the American filmmaker, see Ryan Pickett (filmmaker). On March 17, 2006, the Green Bay Packers signed Pickett to a four-year, $14-million free-agent contract. In his first season with the Packers, Pickett started in all 16 of the Packers regular season games and collected 92 tackles (45 solo), one fumble recovery, and a career-best seven passes defensed. In 2007 Pickett played in 14 games (14 starts) and totaled 39 tackles and recorded his first sack as a Packer. In 2008 he had 48 tackles, started all 16 games, and registered 1.5 sacks and knocked away three passes. In 2009, Pickett accepted the new role to the sole defensive tackle position with Dom Capers using the new 3-4 defense style. Pickett started 13 games with 33 tackles and 2 passes defended. On February 25, 2010, the Packers applied their Franchise Tag on Pickett, but eventually signed him to a 4-year, $28 million deal on March 12, 2010. With B.J. Raji gaining playing time, Pickett transition to defensive end as the Packers mostly used a 3-4 type defense but sometimes played defensive tackle during 4-3 scheme usages. During the 2010 year, Pickett played 14 games with 32 tackles, 1 sack, 1 pass defended, and 1 fumble recovery. Pickett trailed only Charles Woodson as the longest-tenured NFL player on the Packers' defense. He had 2 tackles in Super Bowl XLV but, more importantly, was instrumental in one of the game's biggest plays. On the first play of the fourth quarter, the Pittsburgh Steelers were trailing the Packers 21-17, but had a second-and-two at the Packers' 33-yard-line. Steelers running back Rashard Mendenhall took a handoff and was immediately met in the backfield by Pickett. Pickett had Mendelhall wrapped up, allowing Clay Matthews to force a fumble by sandwiching Mendenhall between himself and Pickett. Packers' linebacker Desmond Bishop recovered the fumble and the Packers offense would march down the field to extend their lead to 28-17. The Packers would go on to a 31-25 victory, bringing Green Bay their first championship title in fourteen years. In the 2011 year, Pickett continued his role at defensive end while B.J. 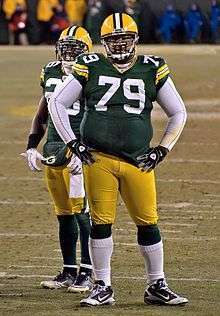 Raji took over as the sole defensive tackle. Pickett finished the year starting 14 games with 33 tackles and 2 passes defended. The Packers finished the season with a 15-1 record for an NFC North pennant, but lost to the New York Giants by a score of 20-37 in the divisional round. In 2012, Pickett started all 16 games with 51 tackles and 1 pass defended. The Packers clinched another NFC North pennant with an 11-5 record, but lost in the divisional round to the San Francisco 49ers by a score of 31-45. In 2013, the defensive line was marred by various injuries, as Pickett regained his role as the sole defensive tackle while B.J. Raji played defensive end. Pickett played all 16 games at defensive tackle with 19 tackles and 2 passes defended. The Packers clinched yet another NFC North pennant with an 8-7-1 record, but again lost to the 49ers 20-23 in the Wild Card round. Pickett's primary home is in San Diego, California, and he spends most of his time there when he's not in Green Bay or traveling with the team. He and his wife, Jennifer, are the parents to six children, the youngest of whom is five-years-old. ↑ "Ryan Pickett". NFL Draft Scout.com. March 25, 2009. Retrieved April 16, 2009. ↑ "Green Bay Inks Unrestricted Free Agent Ryan Pickett". Archived from the original on 2008-02-21. Retrieved 2008-04-01. ↑ "Mendenhall's fumble turned tide for Pack". ↑ "Super Bowl XLV Box Score". ↑ "The Green Bay Packers and their history as a Christian Faith-based Team". ↑ "The Ryan Pickett Foundation (About)". The Ryan Pickett Foundation. ↑ "Ryan Pickett Celebrity Golf Classic". The Ryan Pickett Foundation. Wikimedia Commons has media related to Ryan Pickett.